A little over a month into his tenure as Baltimore City Police Commissioner, Michael Harrison is announcing his first major restructure of the department's leadership. 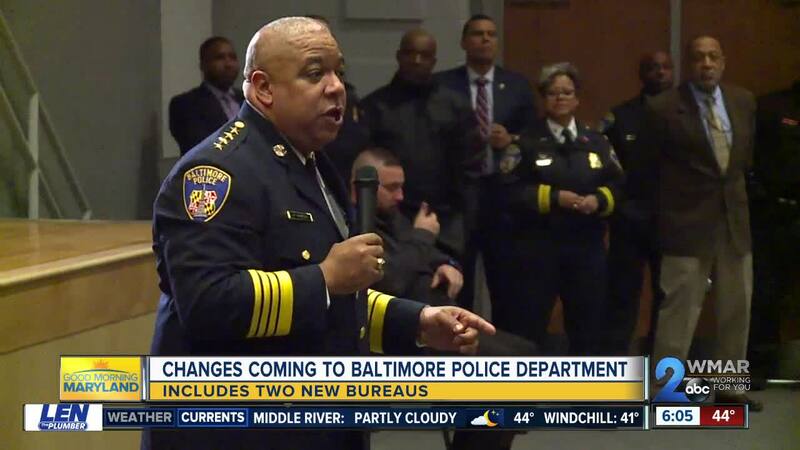 BALTIMORE (WMAR) — A little over a month into his tenure as Baltimore City Police Commissioner, Michael Harrison is announcing his first major restructuring of the department's leadership. As part of the restructuring, Harrison has decided to reduce the number of colonels from six to two and the number of lieutenant colonels from seven to four. Harrison has also moved to divide the department into four bureaus; Administration, Operations, and the newly formed Compliance, and Public Integrity sections. Each will be headed by a Deputy Commissioner. Former BPD Chief of Staff Jim Gillis has been appointed as Deputy Commissioner of Administration, joining fellow Deputy Commissioner Danny Murphy who was recently brought over from New Orleans to run the Compliance Bureau. Eric Melancon has been tapped to take over Gillis' former position. Another development includes, the Community Collaboration Division, commanded by Lt. Colonel Sheree Briscoe now falling under the Chief of Patrol's Office out of the Operations Bureau. The new organizational changes will go into effect on April 24. “These moves are an important first step towards making the Baltimore Police Department a more efficient, effective and responsive organization. We simply had too many people in high-ranking positions without an appropriate span of control to justify their rank,” said Commissioner Harrison. “Moving forward, I will continue to evaluate BPD’s structure and capacity. More changes will be necessary, but we have begun building an effective structure for the Department and putting the right people in the right places."